The manchineel tree (Hippomane Mancinella) is reported to have got its name from the Spanish word 'manzanella' whose translation means 'little apple'. The following article describes a unique case of manchineel poisoning in which a seemingly unknown side effect arose, bradyarrhythmia. Preliminary research showed no cases of ingestion of the man-chineel fruit in which cardiovascular complications arose. Cases reported involved blistering, eye irritations, contact dermatitis, oral oedema and respiratory symptoms. The tree which is indigenous to the Caribbean, as well as the tropical Americas, grows to a height of approximately fifteen metres with shiny green leaves and small round green fruits (Fig. 1). It is popular on many beaches throughout the Caribbean and people are usually advised to avoid contact with the tree as it has a reputation for being extremely poisonous. The leaves, bark, sap and fruit contain toxins that can be very harmful to individuals once they come into contact with them. The fruit is reported to have a sweet smell and pleasant taste; however, the tiniest piece ingested will cause blistering of the mouth and throat. Bullous dermatitis and acute keratoconjunctivitis are the most reported effect of the tree's sap while the toxins have also been known to affect the gastrointestinal tract. These side effects are relatively short lived once treated correctly and the long term prognosis is exceptional (1). Its toxicity has been known since the early sixteenth century. According to historic accounts, the Carib Indians used the sap to poison their arrowheads and the leaves to taint the drinking supply of their enemies. The preliminary research brought forth an article submitted to the British Medical Journal by NH Strickland (2) who was vacationing on the island of Tobago where she and her travel companion ate a piece of the fruit. They soon felt an initial 'peppery' sensation which eventually graduated to a burning sensation and tightness of the mouth. Over the next few hours their symptoms began to worsen, they had difficulty swallowing as a result of the excruciating pain which was caused by oral and oesophageal ulcerations and severe oedema. After approximately eight hours their symptoms began to subside but their cervical lymph nodes remained tender for another few hours. Strickland noted that the drainage of the toxin to the regional lymph nodes was the cause of the cervical lymph node pain (2). On a recent visit to a neighbouring Caribbean state, Antigua and Barbuda, a 57-year old patient saw the apple-like fruit from the manchineel tree and ingested one of the fruit. However, halfway into the second fruit she felt a burning sensation around her mouth and noted dizziness. She was referred from Antigua and Barbuda to Barbados for further evaluation. She denied having chest pain, shortness of breath or palpitations. Penicillin was the only allergy noted and currently no medication was being taken. She had no significant past medical history or family history. She denied headaches, cough, fever, haemoptosis or gastrointestinal bleeding but felt fatigued. She however complained of occasional pedal oedema. She was a cigarette smoker of 10 years. On physical examination, her blood pressure was 140/80 mm Hg, pulse of 44 beats per minute (bpm), respiratory rate of 14 and she was afebrile. Head, eyes, ears, nose and throat examination were normal, lungs were clear, on cardiac examination S1, S2 were normal, there were no murmurs or gallops. The rest of the physical examination was unremarkable. Cardiac enzymes, complete blood count (CBC), electrolytes, glucose, prothrombin time (PT) partial thromboblastin time (PTT) and thyroid function tests were all within normal ranges. The chest X-ray was normal with normal cardiac silhouette. The electrocardiogram [ECG] (Fig. 2) showed sinus bradycardia with a rate of 48 bpm and no ischaemic changes. Using the Bruce Protocol, the patient was placed on the treadmill and reached Stage III; she was unable to reach 85% of her maximum predicted heart rate. She achieved 10.1 METS on the treadmill. The test was terminated secondary to fatigue and completion of protocol. There were no arrhythmias or electrocardiogram changes noted. The echocardiogram demonstrated normal pericardium without any evidence of pericardial effusion. The left ventricular (LV) wall thickness was normal and the intracardiac chamber sizes were normal. The mitral, tricuspid, aortic and pulmonary valves appeared to be normal in reference to morphology and excursion. The E/A ratio was normal - demonstrating normal diastolic function. There was no evidence of significant stenosis or regurgitation and there was no evidence of mitral valve prolapse. The echocardiogram was essentially normal with an overall normal LV systolic function with an ejection fraction (EF) of 70%. A twenty-four hour holter monitor was placed on the patient and it revealed a minimum heart rate of 27 bpm, with episodes of 2.2 second pauses and non-sustained ventricular tachycardia of 8.9 beats at 200 bpm (Fig. 3). She continued to have these episodes ten days after ingestion of the fruit. The patient continued to complain of fatigue. Her symptoms were attributed to her symptomatic bradyarrhy-thmia. 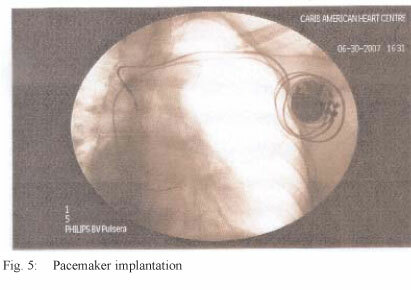 The decision was made after day ten for the implantation of a permanent pacemaker. A DDDR metronic pacemaker was used. The patient tolerated the procedure well. There were no complications. The patient was discharged from the hospital two days after the procedure to be followed-up by a cardiologist in Australia. Permanent bradycardia was never reported as a complication of manchineel poisoning. The majority of cases researched described symptoms which usually resolved themselves within a few hours, however it must be noted that the individuals in those cases usually ingested a smaller quantity of the fruit than the one presented in this case report. Therefore, the quantity of fruit ingested may have a direct correlation to the cardiac symptoms discussed above. It may then be appropriate to monitor patients who have ingested the manchineel fruit for cardiac arrythmias in an ICU. 1. Pitts JF, Barker NH, Gibbons DC, Jay JL. 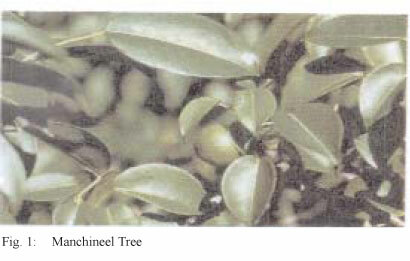 Manchineel keratocon-junctivitis. British Journal Ophthalmology 1993; 77: 284-8. 2. Strickland NH. My most unfortunate experience: Eating a manchineel "beach apple". British Medical Journal 2000; 321: 428.